Definition: Very simply, fasting is the practice of a true Christian abstaining or coming aside from food for a set purpose and a set period of time in order to pray as an act of faith unto their Heavenly Father. Fasting withour prayer is pointless and powerless. We dont fast for health or weight loss. We fast in order to give ourselves over to prayer and the seeking of God's face. What Happens When We Fast? We are causing the natural body with its natural human desires to be submitted to the spiritual man within us – the new creation. Fasting puts down the old nature, prayer lifts up the new. It is an act of self discipline; self control or temperance is a fruit of the Holy Spirit; it is a sign that He dwells within you. It is just one small way of keeping the body under and bringing it into subjection. It involves a humbling of the soul, self-denial - a denial of self by taking up the Cross to follow Christ. It is an act of true discipleship and is always God-ward never man-ward. It is just a token of and fruit of salvation. It shows that the grace of God is working in the heart (Mt.16:24, Rom.6:6-13, I Cor.9:27, I Pet.2:11, Gal.5:22-24). 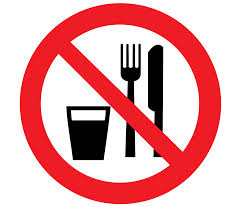 Partial Fast: Daniel and his 3 young friends ate only vegetables and drank water for 10 days. This was a partial fast not a total fast. Some years later we are told that Daniel went on another partial fast. “In those days I Daniel was mourning three full weeks. I ate no pleasant bread, neither came flesh nor wine in my mouth, neither did I anoint myself at all, till three whole weeks were fulfilled.” (Dan.1:12, 10:2-3). We know that John the Baptist only ate locusts and wild honey. Christ said of him, “For John came neither eating nor drinking.” Locusts were the food of the common people, a poor man’s food. It would seem that John lived a life of partial fasting. All his days he never partook of the fruit of the vine in any form. (Mt.11:18-19; Mk.1:6) We are warned however in the Bible that if teachers come “commanding” us to "abstain from meats” we are to reject them and it as a doctrine of devils (I Tim.4:1-6). Water Fast: There are a few times in the Bible where a food and water fast was carried out. Esther and Mordecai called the people to a fast in which they were to abstain from food and water for 3 days. When Ezra was grieved over the people he drew aside to mourn, pray and fast without food or water. The king of Nineveh called for this kind of fast when the city was under threat of judgment. After Paul was converted on the road to Damascus he was lead to a home and spent the first 3 days of his new life in abstaining from food and water. (Est.4:16; Ezra 10:6; Jn.3:7-10; Acts 9:9). I would not suggest such a fast for more than a day without a clear leading from the Lord. 1. In Repentance for Mercy: When the wicked king Ahab heard that God was about to judge him for his sin, he earnestly sought God in prayer and fasting and God heard him. Many other times when the people of Israel sinned against God they turned to him in prayer, fasting and mourning and God heard them and restored them. Even the wicked city Nineveh was preserved when they sought God in prayer and fasting. (I Sam.7:6; I Kings 21:27-29; Jer.36:6-9; Jn.3:5-10). 3. In Ministry unto the Lord: We are told that Anna “…departed not from the temple, but served Godwith fastings and prayers night and day.” At the Church in Antioch we are told the believers were gathered together in a service with one goal, that of ministering unto the Lord. “As they ministered to the Lord, and fasted…”(Lk.2:37; Acts13:2). There should be a season when we come aside to seek God in fasting not in order to get but as a service and ministry unto Him. a job, a spouse, a move, ministry or any other major decision aught to cause us to take time aside to pray and fast. 5. In Separating Leaders, Elders and Missionaries Unto Their Task: Directly after the Father separated Christ to His public ministry He was led of the Holy Spirit into a 40 day fast and then was tempted of the Devil. Afterwards he returned in the “power of the Spirit”to commence his ministry of preaching repentance and healing, saving and delivering. When the call of God came to the Church at Antioch to separate Barnabas and Saul to the ministry, they did so with prayer and fasting laying hands upon them. Again after these two apostles had planted a number of churches they returned to each of them and amidst prayer and fasting they chose and set apart certain men in each assembly as elders (Mt.3:16, 4v2; Lk.4:13-14; Acts 13:2-3, 14:23). Was Fasting not just for the Old Testament times? It is hard to believe any true Christian who reads their Bible could believe such a lie. But it is becoming popular in these days to say such. I cannot give a strong enough “NO” to this question. In the New Testament we have Anna, John the Baptist, Jesus and others fasting. Then after Christ’s death, burial and resurrection we see Paul and the many new Gentile Churches fasting. It is normal New Testament practice. As we read the history of the Church it is hard to find men greatly used of God who did not give themselves to “prayer and fasting.” Savonarola of Florence, Matthew Henry, Jonathan Edwards, John Wesley, Howell Harris, David Brainerd, Charles Finney, C.H. Spurgeon, Andrew Murray, Rees Howells, William Seymour, Smith Wigglesworth, B.H. Clendennen and many others bear witness to this. As we follow such lives we find great advances of the kingdom of God, revivals, miracles and powerful preaching. These men would all pinpoint specific times of prayer and fasting when God met with them. The history of great revivals can never be separated from prayer and fasting. A great revival began in America through Jonathan Edwards preaching his sermon ‘Sinners in the Hands of an Angry God.’ What most do not know is that he had preached this sermon a number of times before without much result. What made the difference? This time his preaching was preceded by 3 days of prayer and fasting during which he barely slept – then revival came. Before the power of God fell at Azusa Street, the small band of believers united in 10 days of prayer and fasting. William Seymour who led that 3 year revival which spread across the world spent weeks at a time in fasting in prayer. This was normal practice for him. What other great revivals will yet come to our lives, families, churches and nations as we prevail with God in prayer and fasting?